UC Berkeley alum Coleman Fung (center with cap) stops by the summer bootcamp for Fung Fellows at UC Berkeley. How can students from diverse majors such as engineering, architecture or Middle Eastern studies find ways to contribute to public health? Where does a public health major fit into an increasingly technological world? And what can these students learn from each other to build a better future for all of us and discover more about themselves? With these questions and more in the minds of its co-creators and participants, the Fung Fellowship launched this fall on its own path of self-discovery. 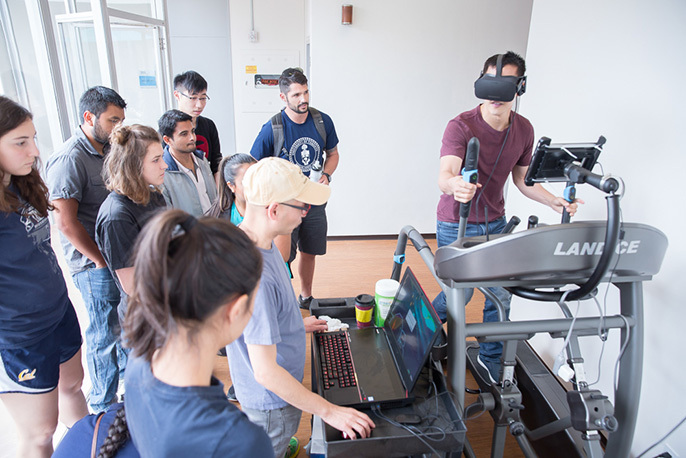 A new collaborative venture between the UC Berkeley School of Public Health and the Fung Institute for Engineering Leadership, the two-year undergraduate fellowship’s goals are threefold: advancement in wellness technology, community outreach and cross-disciplinary learning. The fellowship seems to be sailing on waters once charted by its namesake and co-founder, Coleman Fung. A 1987 graduate of the UC Berkeley College of Engineering, Coleman Fung is the health technology innovator behind Blue Goji, a company that creates cardio-based apps and games. After realizing success in the private sector through technology startups, Fung sought to make exercising a more engaging and entertaining activity. He has pioneered a field which he calls FAM: Fun Activities as Medicine. In using his engineering and business backgrounds to bridge the gap between new technologies and public health, Fung serves as a role model for the Fung Fellows. “Our students aren’t just the best, they’re the best of the best,” says Jaspal Sandhu, design and innovation lecturer at the School of Public Health and faculty lead for the 2016 Fung Fellowship. Sandhu also pioneered PH 290: Designing Innovative Public Health Solutions (Eat.Think.Design. ), another hands-on, innovative learning experience for Berkeley students. While Sandhu, Fung and the rest of the staff have a specific vision for the fellowship, they value keeping that vision malleable. To expand the range of life experiences that its fellows can bring to the program, the Fung Fellowship recruits rising juniors along with veteran, transfer and re-entry students. Diversity is treasured, and new perspectives are a valuable resource. “It’s not just interdisciplinary, it’s massively interdisciplinary. We have students from mechanical and electrical engineering, computer and cognitive science, public health, architecture, Middle Eastern studies, rhetoric and psychology. Across our cohort of 40 fellows, there are at least 15 different majors,” says Sandhu. The interdisciplinary nature of the fellowship is part of what Fung and Sandhu believe will drive the success of the program, particularly when it comes to providing real value to particular at-risk communities. “There’s a diversity that people bring in terms of their academic focus, which is very important to us, but there’s also a very deep diversity of personal life and cultural experiences that people are bringing to bear here,” Sandhu says. Fung Fellow Katie Decker, a mechanical engineering major, is excited about community involvement. She explains how one of her classes piqued her interest in utilizing engineering skills to tackle social and health issues. “I took a social justice and engineering class, 157 AC: An Exploration of Race and Gender. American Cultures classes are usually humanities classes, and it was interesting to see it in an engineering setting,” says Decker. For Decker, the technical side of her career is only part of any solution. The fellowship will allow her to apply her many skills and tools to create new approaches in reducing health disparities. “I want to use my engineering skills and technical expertise, but I feel like if I’m not working with people in communities I’m only tackling half of the problem,” she says. Ian Erickson (left) at the Fung Fellowship bootcamp. During a morning session of bootcamp, Ian Erickson a transfer student majoring in architecture and minoring in geospatial information science and technology — led a small group to identify specific skills the fellows hoped to learn from their peers during the fall semester, hopefully through student-facilitated courses modeled after DeCals. Erickson was drawn to the fellowship in part due to the opportunity for cross-discipline learning. At the two-week bootcamp, the fellows started to exchange skills and knowledge by taking part in design challenges. In these exercises, fellows respond to a prompted scenario from their own particular perspective, then work together to understand other people’s ideas and come up with a product that synthesizes all of those different viewpoints. Following the fellowship’s model of corporate/campus partnership, participatory learning, and immersion in specific communities, the Fung Fellows have the potential to achieve their dreams of original, real-world solutions benefiting the world of public health. Megha Majumder, a triple major in molecular toxicology, public health, and sociology (with an additional interest in biostatistics), applied to the Fung Fellowship in the hopes of gaining a broader perspective on how technology and code can be better used in the policy arena. Bootcamp speakers — such as Judy Li, Joint Venture Health director — already have had an impact on Majumder. “A lot of great people are coming to speak and inspire us. They’ve been giving me a lot of ideas in particular about companies I might want to start and my own model of entrepreneurship,” she says. As the inaugural class traverses the projects and learning experiences they will be subject to in the next two years, the faculty hopes, according to Sandhu, that the fellowship will come to define the undergraduate careers of the students. Thanks in no small part to Coleman Fung.